Office42 has its own configurable employee time management tool which allows employees to click in, clock out, or take a break, while keeping records of each employee’s work time. You or your HR department can set a strict time limit (i.e. work day starts no later than 9 AM) or even opt for flexible work time settings. 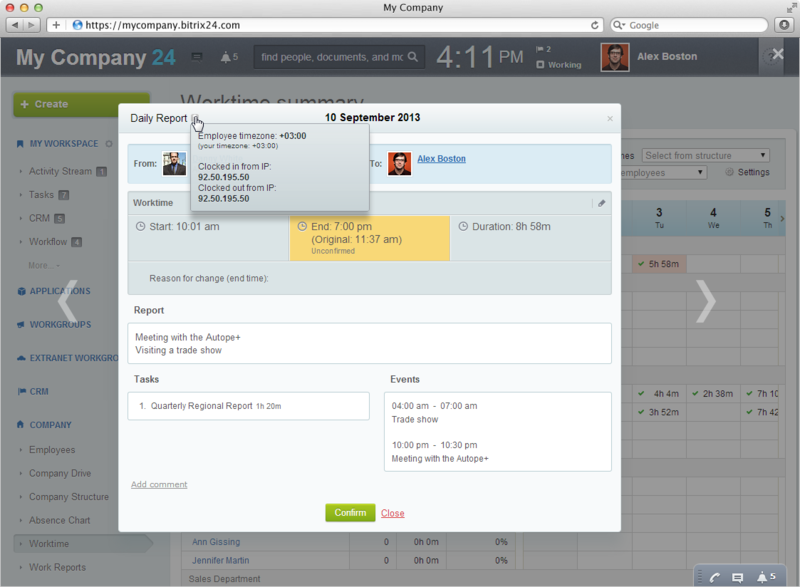 The clock in/clock out feature allows your employees to create daily plans or reports, or create events outside the office, like a meeting. Office42’s employee time management tool also tracks IPs, so it will be easy to determine when your employees are working from the office and when they are telecommuting. 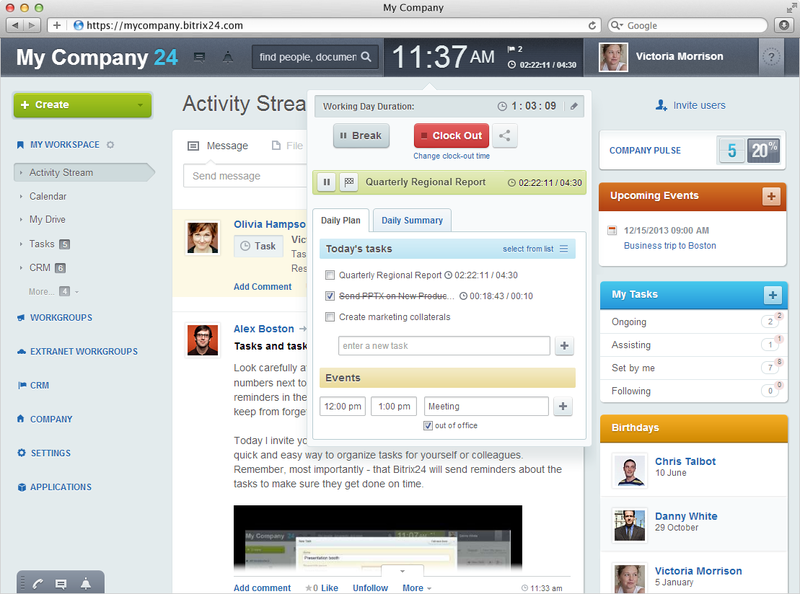 Office42 also offers flexible supervision options within its online time management tool. You, as a supervisor can view work time records for all workgroups, departments or individual employees. You can also send warnings to employees who did not work the required daily minimum or violated the clock in/clock out time rules. 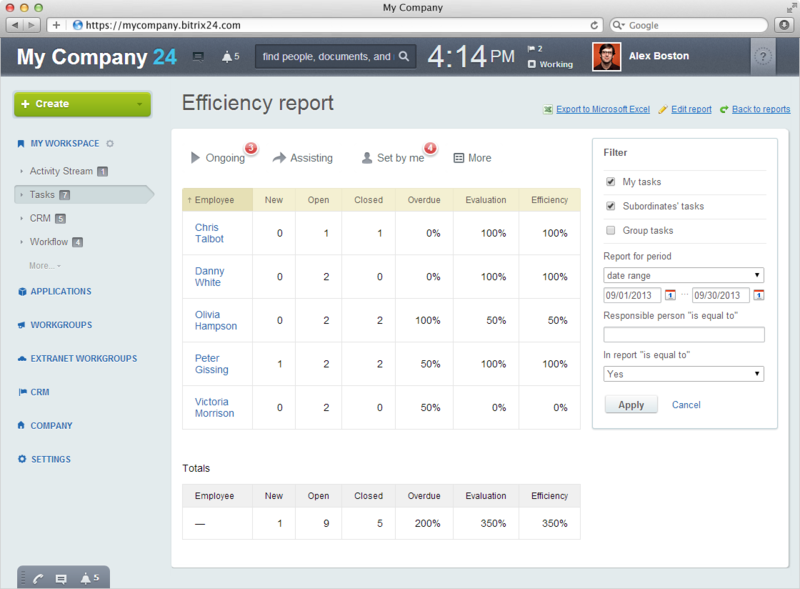 Work reports can be done on a personal, team or company level. You can set up mandatory reporting on a daily, weekly or monthly basis. Office42 will remind employees to send their reports and they can edit or comment them before they’d send them to you or the team leader. Plans for the next reporting period can also be submitted through this form. 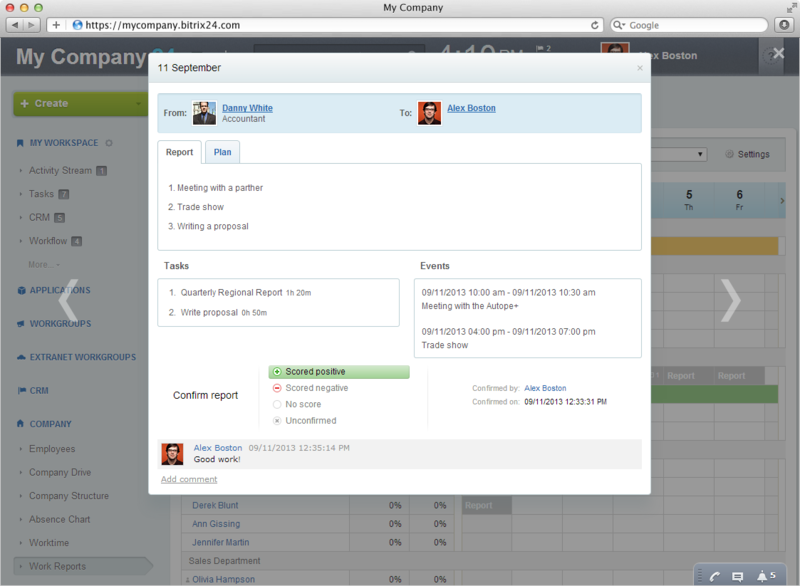 The work report is evaluated by a supervisor and if necessary, report comments can be added. All work reports from a given employee, department, or the whole company can be viewed with their evaluations and efficiency ratings. Thanks to the efficiency reports you can easily evaluate efficiency and productivity of your employees, departments or the whole company. The effectiveness is determined by the number of completed or overdue tasks as well as the evaluation of those tasks by the supervisors. A typical report includes: work load (the number of new tasks over the period, and tasks completed), indicators (overdue vs. completed tasks) and effectiveness (% of completed tasks with positive evaluations by the superior).